TEHRAN — The Iranian authorities arrested 41 people Friday in connection with the twin terrorist attacks in Tehran this week, the semiofficial Fars News Agency reported, as evidence mounted that Iranian Kurds affiliated with the Islamic State had carried out the assault. The men who made their way through the Parliament building on Wednesday, shooting assault rifles, throwing grenades and searching for a way into the main hall, were probably Iranian Kurds, security sources say, though only one has been identified. One of the two assailants at a shrine is understood to be an Iranian Kurd, the security sources said. The Ministry of Intelligence identified one gunman, Serias Sadeghi, as an Iranian Kurd from the city of Paveh in the country’s west near the Iraqi border. In 2014, the Democratic Party of Kurdistan Iran, an opposition party, published a report about increasing Islamic State activities in Iranian Kurdistan that singled him out as a prominent recruiter who, at times, held sessions in a local mosque. One website, KhabarDena.Ir, on Friday quoted Mamusta Molla Ghader Ghaderi, a community leader from Paveh, as saying that some of the attackers were from there. A video posted Thursday on the ISIS media channel Amaq News shows a group of five men with their leader, possibly Mr. Sadeghi, dressed in black with his face masked, claiming responsibility for the attacks in both Arabic and Kurdish. He concluded his message with a threat to Saudi Arabia, saying that it, too, would be targeted. Publicly, the Iranian leadership has sought to cast blame on its favorite targets: Saudi Arabia, the United States and Israel. The assaults “will only increase hatred for the governments of the United States and their stooges in the region like the Saudis,” Iran’s supreme leader, Ayatollah Ali Khamenei, said. While evidence that this week’s sieges were carried out by Iranian Kurds is becoming irrefutable, the Iranian authorities are typically reluctant to admit to having homegrown terrorists or to reveal their ethnic backgrounds. Both would indicate a degree of instability and tensions that the leaders would rather not acknowledge. The fact that the attackers were in all likelihood Iranian Kurds, Sunnis from inside the country, is a source of concern, one analyst said. Scanners, body checks and heavily armed security forces are typically rare sights in Tehran, which had seemingly been immune in recent years to the terrorism plaguing much of the Middle East and Europe. But on Friday, two days after the attacks at the city’s landmark Parliament building and the golden, domed mausoleum of Ayatollah Ruhollah Khomeini, the founder of the Islamic Republic, heavily armed police officers and soldiers were everywhere. Three members of the Islamic Revolutionary Guards Corps stood at every metro station entrance, checking bags and watching for suspicious people. Plainclothes agents, recognizable by their government-issued walkie-talkies, paced the streets, stopping anyone who looked out of the ordinary. 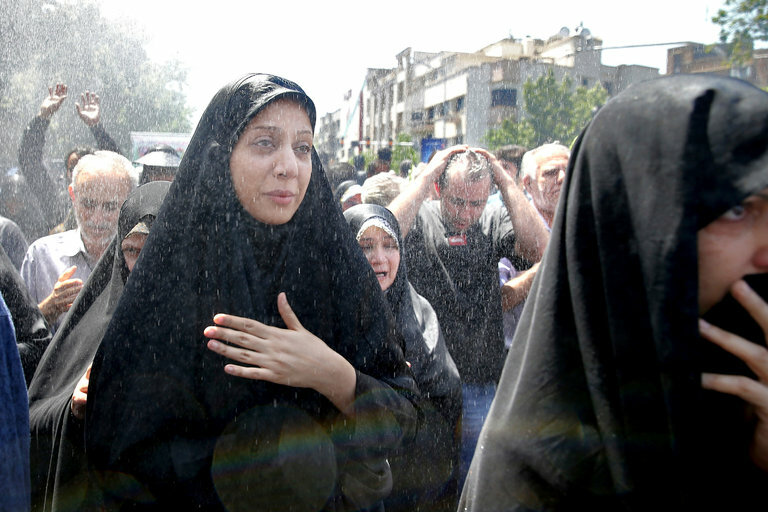 For average Iranians, the initial shock had largely faded into mourning. “I’m just so sad,” said Hamed Heidari, 28, who said he had come to pay his respects at a tribute in Parliament to the 16 victims killed there. Like a number of others who had gathered, he could not get in. Security was tight, and only those on lists were allowed in to participate in the ceremony. Mr. Heidari, who said he made handicrafts for a living, waited outside in the hot summer sun, along with dozens of others. “We just never thought something like that could happen here,” he said. A Muslim with the Islamic State, apparently. The extremist group issues yearly exhortations to its members to instigate attacks during Ramadan against its enemies in Europe and in the Middle East. During Friday Prayer in Tehran, worshipers shouted, “Death to Saudi Arabia” and “Death to the United States, Britain and Israel.” One speaker, a moderator who leads the crowds in chanting slogans, also blamed the United States and Saudi Arabia. “America and Saudi Arabia could not get anything from their proxy wars, so they decided to bring the war here, inside Iran,” he said. Later the prayer leader, Kazem Sadigi, said, “These terrorists are the byproducts of the arrogant powers.” In Iran’s revolutionary language, “the arrogant powers” refers to the United States and its allies. Outside of the Friday Prayer venue, on Enghelab, or Revolution Street, mourners gathered around trucks using trailers to carrying the coffins of some of those who died in Wednesday’s attacks. One carried three coffins with three names: Ali Toudehfallah, Ali Gholizadeh and Reza Sabeti. A military band sat in the sweltering sun, also on top of a trailer, waiting for the procession to start driving through downtown Tehran. Along the route two women were waiting to pay their final respects to a colleague, who had been shot dead while in a waiting room outside the main hall of Parliament. The victim, Hanieh Akbarian, 37, who taught adults to read and write, had come to Tehran to ask her local lawmaker to help her with insurance. She was among the first people killed. “She just loved her job, helping people, teaching them to read,” Faezeh Mirzaei said. “I can’t believe she is dead,” said her friend Firouzeh Naghdizadeh. A version of this article appears in print on June 10, 2017, on Page A4 of the New York edition with the headline: Iranian Kurds Implicated In Dual Attacks in Tehran.